As you gain success and experience in your business, you may be asked to speak at a large function. Whether a charitable dinner or awards ceremony, your speech will show off your expertise in the industry. 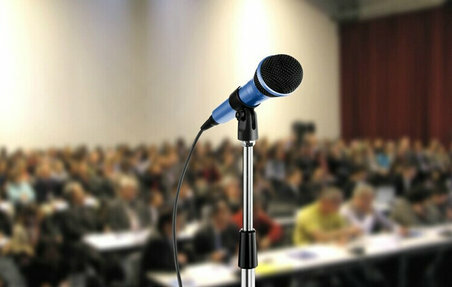 Although speaking in front of a large group of people can be scary, even those with stage fright can speak successfully to the group with adequate preparation. 1. Practice your speech before the big day. The more you have it memorized, the better. If possible, practice the speech in front of a friend or family member to get used to saying it to real people. If you feel you must have note cards, limit the amount to about three cards. This will force you to keep your speech concise and help you keep your eyes focused on your audience. 2 . Remember why you've been invited to speak. If you're battling fear over speaking to a large group of people, keep your mind on the fact that you were selected for this important role. The speech organizers must have seen something valuable in you or your expertise. The knowledge of other people's respect for you should abate some of the fear. 3 . Remember that fear of public speaking is very common. In fact, it's normal to feel nervous or stressed out before a big speech. Most of the people in the audience would be feeling the same fear and stress that you do in your position. Knowing this may make you feel better. 4 . Mention your audience in your speech. What you say should be tailored to why you're there and who you're speaking to in order to avoid sounding generic. If speaking to a charitable foundation, mention the good work certain specific individuals have done for the cause. If speaking at a business conference, briefly state why you want to help these people. 5 . Be concise. Long, drawn-out speeches are boring. Get to the point. While humor is welcome in a speech, limit your jokes to only a few so you can focus more on the topic of the speech. Limiting your note cards will help with this.